There's always something to be said about those who are able to weather the testy climate of business politics. At the end of the day, the folks who are able to roll with the punches reap reap the rewards of success. Enter the Corporate Giveaways Annual Buyer's Show on Business Gifts, Premiums, Promotional Ideas & Merchandise Incentives, an annual fete that has been gathering a specialized group of exhibitors under one roof, for 26 years in a row. A lengthy title isn't all the Corporate Giveaways has under its belt, there's also a whooping two decades in the industry and a heritage built from hands-on experience. The idea of the event started when Worldexco Chairman, Lynn Romero was the PR director of one of the country's leading hotels. She needed to find a ready and reliable source of specialized gifts for the hotel's clients and partners. What began as a personal quest eventually turned into a wonderful solution for marketing professionals who were experiencing the same dilemma. "We have an obligation to provide our exhibitors with the market they want." says Raquel Romero, General Manager of World Expos & Concepts Inc. "Just think about it, how many sure buyers can you really get from making cold calls? 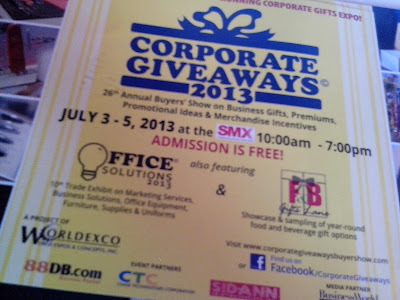 At Corporate Giveaways, the customers come to you. At this point, they have a market to pitch to; all they have to do is impress with their products and services. In addition to a sure ticket to profit, visitors of Corporate Giveaways Buyers' Show also receive the guarantee of quality from this mix of manufacturers, traders, and importers. Aside from a core group of exhibitors, including Manel's Leathergoods, Star Paper, Tieline, Memo King, and others, the expo also features newcomers obtained through a referral system, filtered through rigorous criteria before they make the cut. Selection hinges on the quality of goods and the legitimacy of their corporate business gifts. The 26th Corporate Giveaways Annual Buyers' Show on Business Gifts, Premiums, Promotional Ideas & Merchandise Incentives will take place from July 3-5, 2013, at the SMX Convention Center, Seashell Lane, Mall of Asia Complex, Pasay City.